A while back I smoked one of La Aurora cigars, the Maduro Robusto from the La Aurora “basic” line. Although I was a bit disappointed the cigar still had something that tickled my taste buds and I mentioned back then that I would be looking to try more of the cigars from this brand. As often happens, that sort of slipped my mind, until a few days ago Cigar Inspector posted his as always interesting review of the Series 1495 Robusto from La Aurora. Guess what: I had exactly the same cigar in my humidor, I had wanted to try it for a while and I had completely forgotten about it! So thanks to Cigar Inspector for acting as inspiration for this review. The 1495 series certainly isn’t a new release: it was created in 2005 by Jose’ Blanco, the sales director of La Aurora and celebrates the year when the town of Santiago de los Caballeros was founded , in the heart of Dominican Republic’s foremost cigar region El Cibao, by Cristoforo Colombo (Cristopher Columbus for you non-Italian speakers out there). There is an interesting interview with Blanco on Cigar Aficionado which describes how this cigar came to be and the idea behind it. I am certainly intrigued to read that this has some Peruvian ligero in its filler, which is new to me. Price: around 7.50-8.50$ for singles in the US (and about 160$ for boxes of 25). In Germany these go for 5.50€. Not available in the UK. Filler: The info on La Aurora’s website is slightly contradictory, but I’ll take for good what Jpse’ Blanco mentions in the CA interview, i.e. Dominican Corojo ligero and Piloto Cubano, Peruvian ligero and Nicaraguan (piloto cubano?). Body: Starts medium/full and gets somewhat stronger as you smoke. This is a nice looking cigar: brown, slightly oily wrapper with a light reddish tinge. It is well rolled and the triple cap, going well over the shoulder, is carefully applied. It is mostly free of veins but there is a rather prominent one at the back (compared to the band) of the cigar. The smell of the wrapper reminds me of leather and spices and once cut the pre-light draw has pepper and again leather. On the tongue the wrapper leaves a very peppery taste. As with the appearance, the smoking characteristic of this cigar are almost fault-less. The draw is perfect, free with just a little resistance and the burn stays mainly straight although it does canoe a bit, but the light grey ash is solid and falls only every inch and a half. You can leave the cigar for 2-3 minutes and it will continue to burn slowly but nicely without going off. The amount of smoke is really impressive, probably the most (or close) I have seen in a robusto. The initial taste is of leather and pepper with more and more Corojo sweetness showing up as I smoke. The flavours are really clean and although quite spicy, it is a smooth cigar; there is no rough, green or bitter taste. If you have read CIgar Inspector’s review, you will know that he found a lot of pepper in the first 10 minutes. I cannot say my experience was like his, although there certainly is a lot of pepper throughout the first section – maybe a normal difference in a hand-made product. The main taste remains the same, with leather, pepper (slightly less) and sweetness but at the same time cedar and earthy notes add to the complexity. About halfway I got a real marked tar taste and I mean taste; the cigar does not become tarry in any way, it is just a flavour a bit like what you get on some aged red wines. It puzzles me a bit, but once I get used to it it works fine. The final part becomes more woody (cedar) than leather, the pepper decreases a lot and gives way to nutmeg and the finish, especially after the first half inch of this section is an intense and long lasting chocolate and cinnamon (a bit like a thick spiced chocolate drink)… but the tar taste remains on the finish too and the chocolate/tar combo, although not a problem, doesn’t really work for me. Also the last part of the cigar becomes a bit too hot for my taste rather quickly. My first encounter with La Aurora Cigars wasn’t exactly mind-blowing, but this 1495 Series has certainly a lot more to offer than the basic La Aurora Maduro I had a while back. This is certainly a cigar that deserves to be.tried if you haven’t. Personally it did not wow me, mainly because of the taste, but it really is only a matter of personal preference. Looking at it as objectively as possible you can see that this, as Jose’ Blanco mentions (in the interview I linked in the introduction), is a cigar blended for taste and quality and I scored it 89. Ont hing this cigar has dne is certainly to stimulate my curiosity on Dominican and Peruvian tobaccos, so I have a question for you: is there any Dominican puro and/or another cigar made with Peruvian filler you would suggest is worth trying? Look forward to any tips. Thanks! 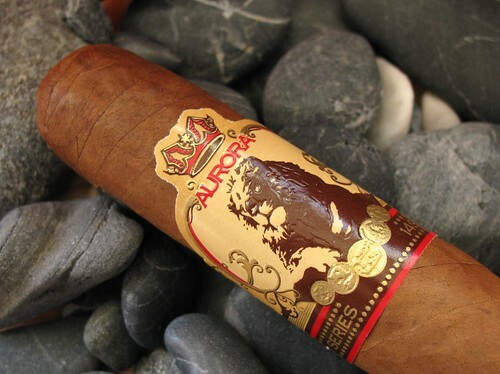 This entry was posted in Blend, Cigar Reviews, Dominican and tagged Cigar Review, Dominican cigars, La Aurora, Robusto. Bookmark the permalink.